Strawberry Fuzz NicQuid E-Juice takes the sweet flavors of peach and strawberry, mixes together, and creates one amazingly tasty e-liquid. Thanks to NicQuid's mastering of the mixing process, they can deliver unique and authentic flavors alike, that taste exactly as expected. In addition, NicQuid is based right here in the US, with every part of their process, including packaging and bottling, being done in the states. 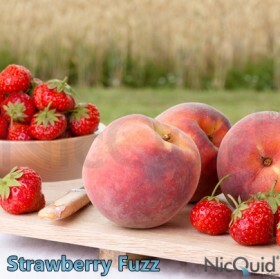 The strawberry fuzz flavored e-juice by NicQuid comes in 0mg, 6mg, 12mg, 18mg and 24mg strengths.